Part of our Nature Series Desert Event Pack, this is a brilliant full color, 291mm x 436mm poster with a designer photo of a desert in the background. Add 8 sponsor logos to the poster. 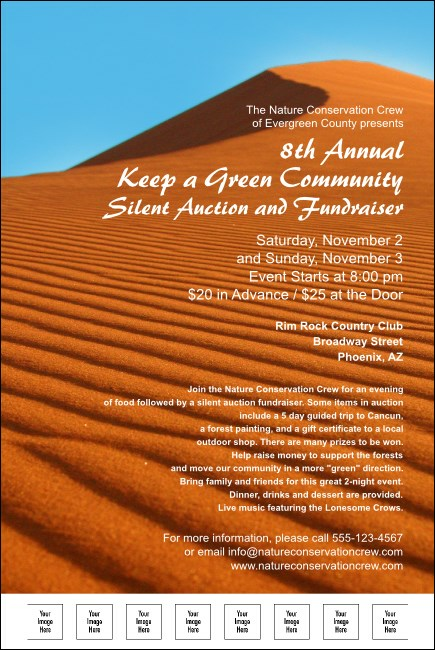 Printed in full digital color, the Desert Event Pack templates are versatile and can work with many events and communications themes including conservation, environment, nature, outdoors, and religious.